This module provides an overview of the polymerase chain reaction (PCR), describes PCR using an analogy to photocopying a book, provides links to animations describing PCR, and provides examples of analysis of PCR products. 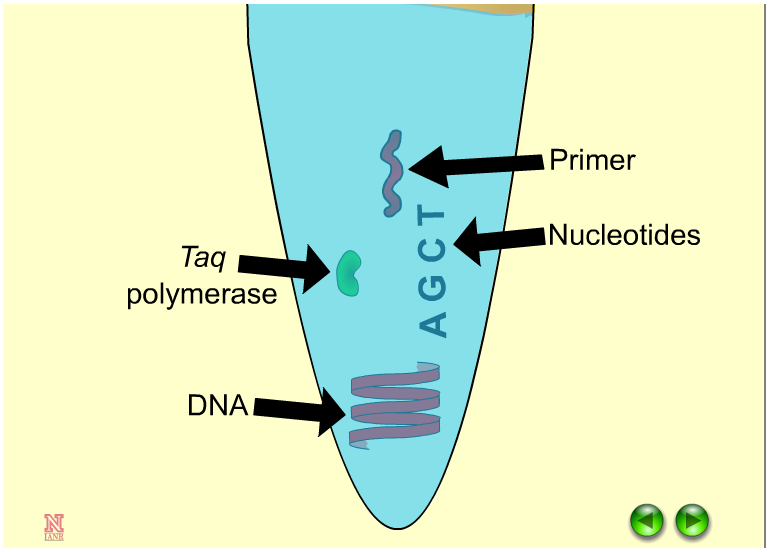 The polymerase chain reaction (PCR) is a procedure that mimics the cellular process of DNA replication using the machinery of heat-resistant bacteria in a cyclic manner, resulting in several million copies of a specific DNA sequence that can then be visualized through electrophoresis and staining with a dye. PCR is commonly used in plant genetics and molecular breeding to copy a specific DNA fragment from the genome of an individual as a step in the process of molecular marker assisted selection. The use of PCR to copy a specific portion of a genome is analogous to photocopying a specific page of a book. Table 1 illustrates this analogy by comparing the component required to copy DNA by PCR to those needed to photocopy a page of a book. Table 1. Comparing components in PCR to photocopying a page in a book. In the same way that a bookmark identifies the specific page to photocopy out of a book, PCR primers identify the specific fragment to be copied from the entire genome. In order to copy a page, the photocopier uses the paper and toner to make the copy. Similarly, the polymerase requires nucleotides to produce a replicate of the original DNA fragment. Another animation on PCR can be found at the Dolan DNA Learning Center, part of The Cold Spring Harbor Laboratory. The Genetics Science Learning Center at the University of Utah also has an animation on PCR. 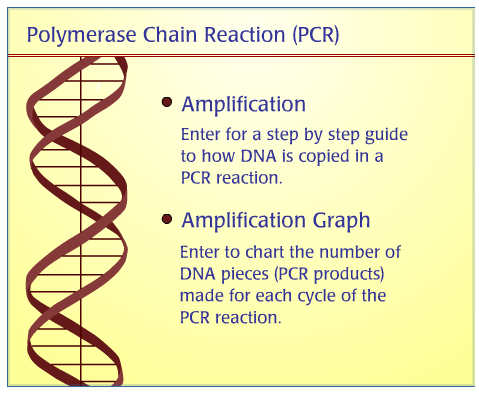 Namuth, D. M. Polymerase chain reaction [Online lesson]. Plant and Soil Sciences eLibrary, University of Nebraska - Lincoln. Available at: http://plantandsoil.unl.edu/croptechnology2005/gen/?what=topicsD&topicOrder=1&informationModuleId=968252315 (verified 27 March 2012). 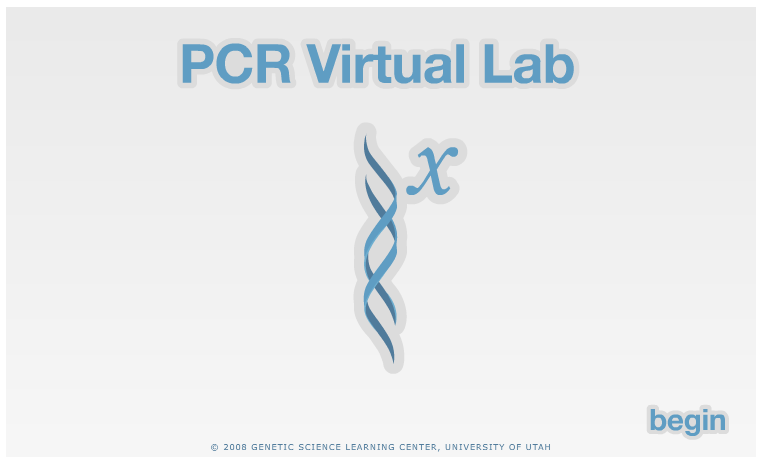 PCR virtual learning lab [Online lesson]. Genetic Science Learning Center, University of Utah. Available at: http://learn.genetics.utah.edu/content/labs/pcr/ (verified 27 March 2012). Polymerase chain reaction [Online animation]. Dolan DNA Learning Center, Cold Spring Harbor Laboratory. Available at: http://www.dnalc.org/resources/animations/pcr.html (verified 27 March 2012). For some PCR related entertainment, we recommend "The PCR Song". With lyrics such as "PCR, when you need to find out who's your Daddy; PCR, when you need to solve a crime..." this video produced by BioRad features characterizations of famous and not-so-famous folk singers. If you like the musical theme, the "GTCA Song" song rocks to the tune of YMCA while reviewing the biochemistry of PCR. GTCA [Online video]. YouTube. Available at: http://www.youtube.com/watch?v=ID6KY1QBR5s (verified 27 March 2012). The PCR song [Online video]. YouTube. Available at: http://youtu.be/x5yPkxCLads (verified 27 March 2012). Mention of specific companies is not intended for promotion purposes.